“Sing Better In A Day!” gives singers the opportunity to meet and work with Ruth Gerson who created The Singingbelt in the classroom. For singers and public speakers, participants learn the mechanics of singing, and how the voice works including: diaphragmatic breath support, breath placement, and posture and positioning of the tongue, mouth, jaw, larynx and palate. Students also learn to apply vocal warm-ups to singing techniques, to master diphthongs (combined vowel sounds) and difficult intervals, as they are introduced and instructed on how to develop their ear training, expand their vocal range, learn to sing in tune and refine pitch. Ruth’s Singing Belt is a new and innovative tool to help people improve their vocal presence, pitch and breathe control, helping me finally understand my adnominal muscles, that I never new I had and learning to keep my diaphragm flat. I highly recommend attending her vocal workshop for anyone desiring to be more in control of your voice. Learn to support your voice and sing on pitch! The Singingbelt System Workshop will widen your range, strengthen your voice and relieve stress and strain on the vocal cords. 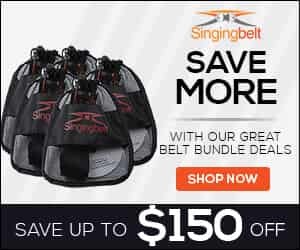 The Singingbelt System is included with this workshop when you order now. Sing Better In A Day!” was a fantastic part of the 2011 West Coast Songwriters Conference! Regularly $115.00. Now Only $99.95. 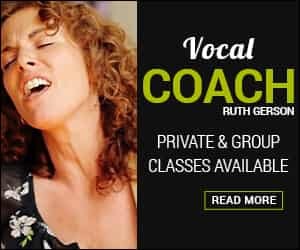 Star vocal coach and inventor of the Singingbelt Ruth Gerson teaches “Sing Better In A Day!” the one day Singingbelt System voice workshop. Can’t find the city you’re looking for?